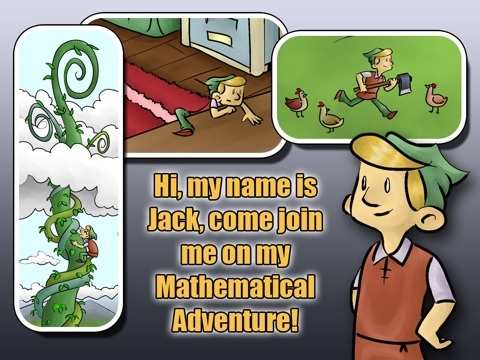 Jack and the Beanstalk: A Mathematical Adventure is an interesting blend of interactive ebook and math practice. 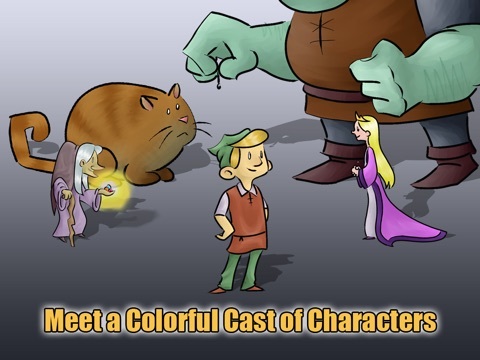 Students will enjoy exploring the story and solving the problems embedded within it. 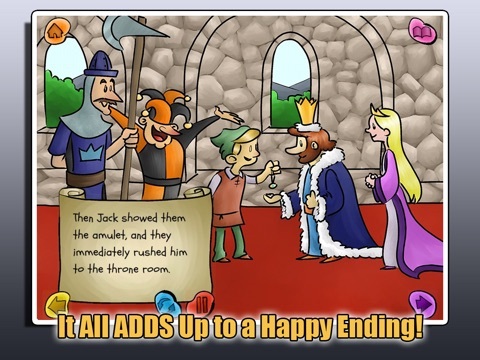 This app retells a version of the classic fairy tale with situational math problems embedded between sections of the story. Skills include counting money, skip counting, estimation and more. 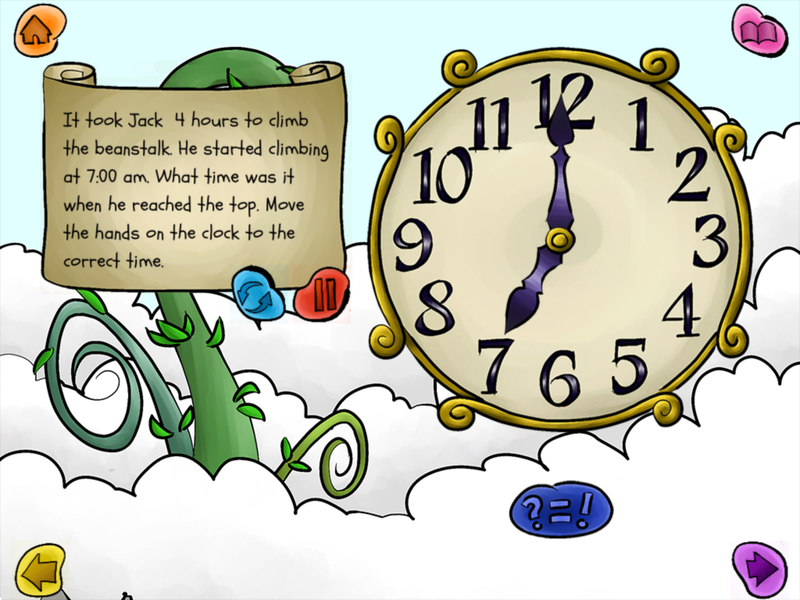 Jack and Beanstalk: a Mathematical Adventure shares the familiar fairy tale with a few unusual twists and turns. 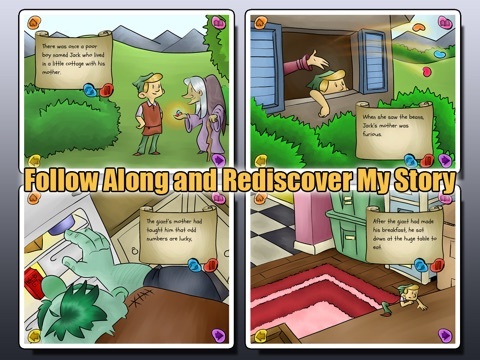 The story itself is a bit modified from traditional tellings, and between the ten sections, users are engaged with a variety of math activities embedded right in the story. The problems cover a range of elementary level mathematical concepts, including making change and counting money, measurement, counting by 5’s, elapsed time, one to one correspondence, greater than/less than, even/odd, shape recognition, and estimation. New numbers are inserted into the problems with each presentation, so the software can provide several rounds of unique practice. One minor problem with the app is that the story sentences are narrated aloud with no option for independent reading. The voice frequently finishes saying the sentences before the words, which are presented in type-writer fashion one letter at a time, have fully appeared. This can really slow down the pacing of the story. There does not seem to be an option to turn off the narration, which may become annoying after a few uses of the app. One concern is that there are some grammar errors in the printed sentences while the story is narrated. For example, in the first section a closing set of quotation marks is missing from the end of the sentence spoken by Jack’s mother, and in the third section, there is a missing possessive apostrophe where Jack is thinking of his mother’s bean soup. The mathematical content of Jack and the Beanstalk makes a good quick overview of elementary level math skills. Each problem hits a different category of skill, making a nice review for middle and upper elementary grades. There are tastes of computation, elapsed time, money, geometry and more. The problem numbers change with each viewing, so they will present unique challenges for students. It’s also possible to skip the story narration and go straight to the math problems in each section if that is what students want to do. Response modes are also very creative. 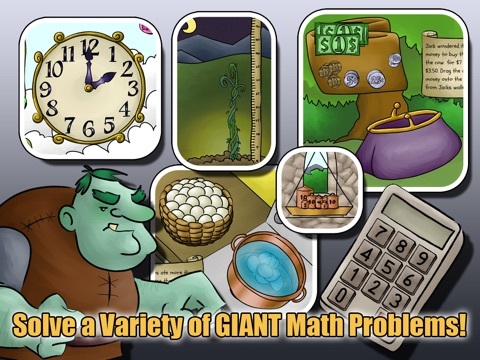 There are problems that require students to manipulate the illustrations, such as moving money from Jack’s wallet to the old woman’s purse and pulling the beanstalk up to the proper height after completing the required multiplication. There are sorting activities, calculation activities, and counting activities. This is a refreshing change of pace from apps that simply require entering the correct answer on the keyboard. As we mentioned previously, we are concerned with grammar errors in the printed sentences while the story is narrated. For example, in the first section a closing set of quotation marks is missing from the end of the sentence spoken by Jack’s mother, and in the third section, there is a missing possessive apostrophe where Jack is thinking of his mother’s bean soup. Jack and the Beanstalk: a Mathematical Adventure will be enjoyable for students on their first pass through when the story seems fresh and new. The math problems are also engaging because they are so well intertwined with the story. I have some concern about the “staying power” of this app, though, since students are likely to feel a bit bored with the story after a few readings. There would be little motivation to start the app up just to redo the math problems. In a classroom setting, however, this app would be perfect. Many different students could use it once or twice, making it a good investment. This app is priced at $2.99 and will be an outstanding value if it will be used by multiple students, as in a family or classroom setting. It provides fun practice for many important elementary math skills embedded in an engaging story. In addition, there are supplemental materials available from the developer’s website at http://www.mathfilefoldergames.com/. These would be very useful in the classroom or in a homeschool setting. There are no outside advertisements in this app, no links to social media, and no connection to the internet. There doesn’t seem to be any kind of section set aside for adults at all. Developers may want to consider including some mechanism (protected from children’s use) for contacting and getting support. Even a printed notice about the website would be nice, since there are also support materials available.